Bobbing along the waves between Filfla and the Żurrieq coast, a rescue vessel packed with migrants braces itself for the rough weather expected to make its way towards Malta from tomorrow. “We do not want to stay here in storms anymore, please. It makes us sick, all of us - 32 people - in one room on a boat, like animals, we are not happy, this is not fair. There are women and children, and everybody is scared - we just want to be safe,” said Diamond, a Nigerian asylum seeker onboard the Sea-Watch 3. He is one of 49 migrants who have been stuck for almost three weeks on board two NGO rescue vessels just a few kilometres off Malta’s southwestern coast. 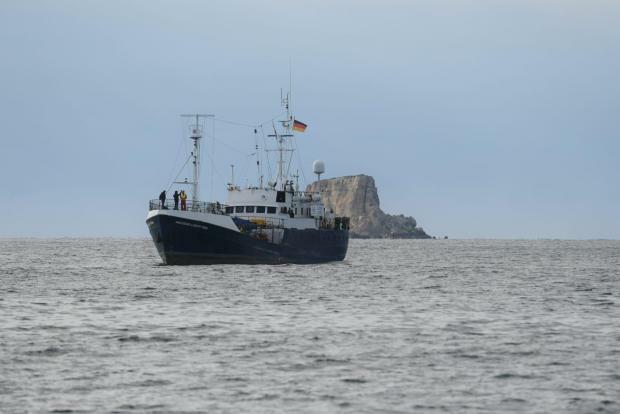 Both Malta and Italy have refused permission for the NGO vessels to enter harbour, but Malta last week allowed them to enter its waters to shelter from rough seas. Times of Malta on Tuesday joined the stranded migrants for a rare glimpse of life at the forefront of the Mediterranean migration crisis. “We have crew and the guests [rescued migrants] being sea sick together. It is a day-to-day struggle to keep people from losing control or giving up. These are people who have been through multiple traumatic experiences, they have symptoms of post-traumatic stress disorder, they have been imprisoned, in some cases raped and tortured, and now they are within distance of safety but there is nothing they can do,” he said. The few migrants on board willing to face media cameras recounted how the experience of being locked in a floating prison at the gates of Europe, is all too familiar for those who endured nightmarish captivity in one of Libya’s detention centres. “It was no good in Libya, you do not know how they treat us, like animals,” another migrant said, his stoic brow refusing to give in to tears. After having endured repeated abuse in Africa, it is now the European Union migration policy and the stubbornness of frontier member states, such as Malta, that is causing them distress. Looking towards the Maltese cliffs, one migrant - a teenage Egyptian who dreams of playing basketball and making new friends, said he has to relinquish control of his own fate as he clings to hopes for a better life. “We do not know what is going to happen to us. We just want a safe port so that we can be safe and not at sea. Please European governments don’t leave us here,” said Austin, another Nigerian migrant. Meanwhile, asked if there had been any communication with the Maltese authorities, Mr Heaton-Heather said that all the team knew was that they were not authorised to disembark the migrants onboard the two ships in Malta. Moving closer to the port might shelter the vessel from bad weather forecast for the coming days, but having to move back out to sea when it clears out would be another major blow to the migrants’ already battered spirits. “I have made it clear to them I will not leave until they are given a safe port. This is all we can do, be honest with them and show solidarity,” he said. In a statement, the Maltese government said it was closely monitoring the situation and would be granting assistance in case of emergency, as it was bound by law until a solution to the current impasse was found. “Malta is once again being called to take upon itself responsibilities which are beyond its remit when it comes to showing European solidarity in practice,” the government said. It reiterated that it did not have legal competence to rescue migrants who were intercepted in Libya’s search and rescue area, closer to Libya, Tunisia, and Italy. The NGOs, the government said, were denied entry in other European and non-European safe ports and proceeded to loiter in Maltese territorial waters. While these cases were happening, Malta rescued a further 249 migrants, fulfilling all its obligations as it had always done. The smallest European Union state was now being called on to disembark the migrants on these NGO boats as had happened a few months ago with Malta taking an active role in providing effective solidarity. It said that, in this context, the discussion on ad hoc relocation should not be limited to the persons on board the two NGO vessels but extended to a portion of the persons rescued and already in Malta, as a sign of goodwill. Discussions, the government said, were underway and the government wished they would be concluded in the coming hours. “A long-term European solution for similar issues in the future should be a priority to avoid a repeat which put even more burden on a member state like Malta which always abides by its obligations,” the government said. MEP David Casa on Wednesday sent a letter to all his peers, saying action was needed as the situation was deteriorating rapidly. "I have sat through 15 years of declarations in this house on safeguarding human life and solidarity with southern European member states," he lamented. "This is the time to put those words into action."